After years of political wrangling, regulatory delay, and economic uncertainty, California’s $100-billion high-speed rail (HSR) project is finally under construction. Though the project has more than doubled in cost and is now over 11 years behind schedule, the California High Speed Rail Authority, a public agency tasked with planning, designing, building, and operating the 300-mile route, has broken ground on a variety of key construction initiatives since 2016. The agency is currently working on 20 sites scattered across five central California counties in an effort to build a 119-mile proof-of-concept route between Bakersfield and Madera by 2022. 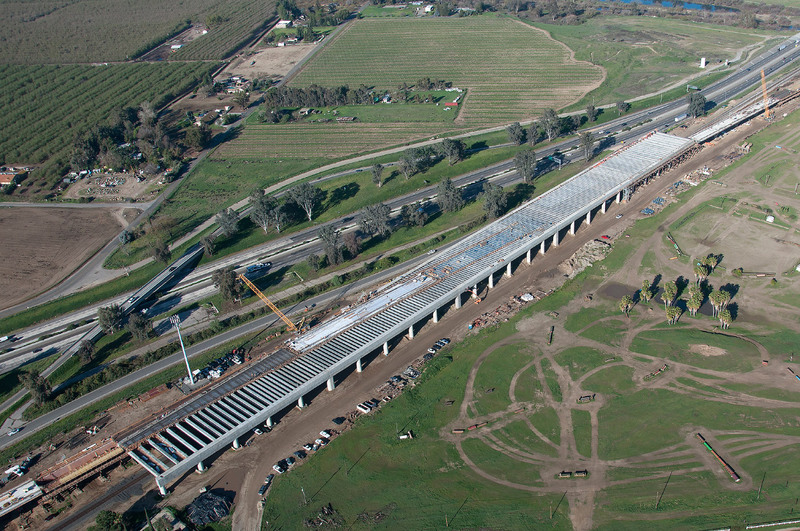 Among the multifaceted works underway are the 3,700-foot-long Cedar Viaduct that will carry high-speed trains over State Route 99 in Fresno, and the 4,700-foot San Joaquin River Viaduct that will span the San Joaquin River to the north. The aerial alignments are test runs for the types of layered sites the authority will have to build over in more densely populated centers. 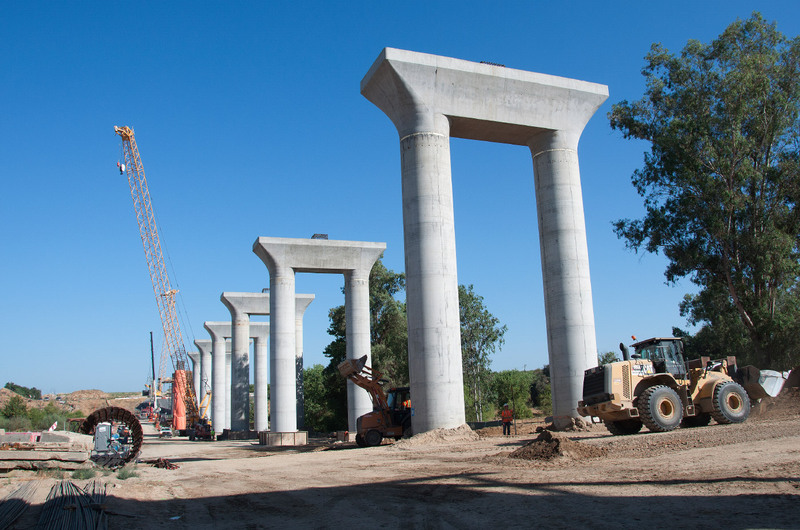 Here, where temperatures can reach 110 degrees during the day, workers are laying rebar for structural columns, balancing new concrete slabs on elevated spans, and acquiring new properties to complete the future rail alignment. Roughly halfway between the two ends of this initial route, the Dragados-Flatiron Joint Venture Precast Facility outside of Hanford is currently under construction, as well. The precast concrete factory will supply girders and precast slabs for the bullet train project when it opens in 2019. Ultimately, the facility will produce roughly 1,300 different types of beams and nearly 500,000 precast slabs for the rail line. Though far from the state’s major urban centers now, when the full route is completed in 2033, it is expected to carry over 30 million passengers each year on trains traveling between 110 and 220 miles per hour.